A study by Australian researchers has questioned the integrity of other studies funded by the artificial sweetener industry. Writing up their findings in PLOS ONE, researchers at the University of Sydney claim studies funded by artificial sweetener companies were nearly 17 times more likely to reach conclusions favorable to the industry. "It's alarming to see how much power the artificial sweetener industry has over the results of its funded research, with not only the data but also the conclusions of these studies emphasizing artificial sweeteners' positive effects while neglecting mention of any drawbacks," said co-author Lisa Bero. Bero says the results of these studies can have enormous influence, since they are often used by governments in the development of dietary guidelines. The researchers also point a finger at the authors of these studies, claiming many had undisclosed conflicts of interest. In fact, they say 42% of the reviews were written by people with a conflict of interest. "Our analysis shows that the claims made by artificial sweetener companies should be taken with a degree of skepticism, as many existing studies into artificial sweeteners seem to respond to sponsor demands to exaggerate positive results, even when they are conducted with standard methods,” Bero said. Many consumers turn to products with artificial sweeteners in an effort to reduce sugar consumption. 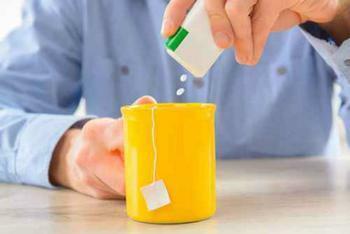 In its analysis of artificial sweeteners, the Mayo Clinic reports there may be some advantages, as well as drawbacks. On the plus side, the Mayo Clinic says these sweeteners may help you control weight, and be a good alternative to sugar if you have diabetes. It says artificial sweeteners usually don't raise blood sugar levels because they are not carbohydrates. At the same time, the Mayo Clinic acknowledges that there have been health concerns about artificial sweeteners over the years, including possible links to cancer. “But according to the National Cancer Institute and other health agencies, there's no sound scientific evidence that any of the artificial sweeteners approved for use in the U.S. cause cancer or other serious health problems,” the Clinic says on its website. But in recent years, some researchers have questioned artificial sweeteners' effectiveness in weight control. A 2008 Purdue University study linked artificial sweeteners to weight gain. More recently, researchers in the UK suggested people who were obese and consumed artificial sweeteners could have complications with glucose management.